Note: The following is an attempt to predict the reaction following the Colts-Ravens game that operates under the assumption that the Ravens win. It is a purely fictitious representation of what will really happen in the game. Unless this is 100% accurate, in which case that's totally what I meant. Ray-Ray’s retirement. 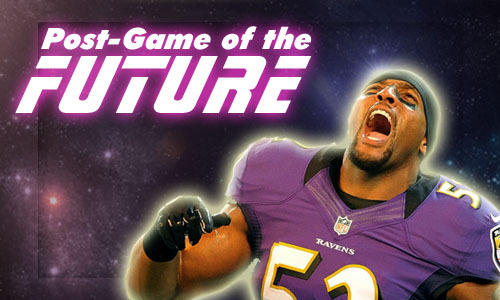 The Baltimore Ravens play inspired football after Ray Lewis announces plans to retire after this season. His decision sends a stabbing pain through the entire team, which hopes to make a Super Bowl run because anything else would be a double stabbing pain. It’s Flacco, not Falco. Finally, the best QB no one cares about does something in a big game. Joe Flacco tells reporters he feels unshackled by the dynamic play-calling and outgoing personality of (former Colts coach and current offensive coordinator) Jim Caldwell. “Everything that man does is entertaining and innovative,” Flacco says after the win. Ed Reed grows wings. “They’ve always called me a ball hawk,” Reed says, flapping away after a three-interception game. Revenge game. “This is for what they did to us, for what they did to the people of Baltimore,” cornerback Jimmy Smith says after the game, failing to note that he’s from California and that the Colts have been in Indianapolis for his entire life. Different guy. “Look, I’m a defensive back. I don’t run the football and I don’t have 4.2 speed,” says defensive back Chris Johnson, reminding reporters that he’s not that Chris Johnson. The Chuck stops here. “It’s been a great story and Chuck Pagano was a valuable member of our staff before he joined the enemy. The magical unicorn of Chuckstrong died today. I know that sounds insensitive, but I’m a Harbaugh,” says head coach John Harbaugh. Elaine Benes? Elaine Benes. “I’ve never really told this to nobody, but that ‘Seinfeld’ episode where Elaine dances is my primary inspiration,” says Ray Lewis of his famous pregame seizure dance. Held something back. “They didn’t win because they held something back,” says analyst and Hall of Fame quarterback Dan Fouts. They still let him talk? “And that’s why I think the Colts should’ve traded the first pick and drafted nine receivers, one for each round,” says Mitt Millen, somehow unaware that the NFL Draft involves only seven rounds. Maybe a bit harsh? “The Ravens are a really likeable team,” says no one ever.